“Hello, so you are reporters doing a story on Tiki’s?” said the beaming California gal warmly as she came up to our table. She was Sarah Mendoza, manager of Tiki’s Grill and Bar (NOT “Bar and Grill,” as most places would have it). This was after Chris’ plate of miso butterfish and a Volcanic Sunset, and my order of ginger soy grilled salmon with a Miller Lite. 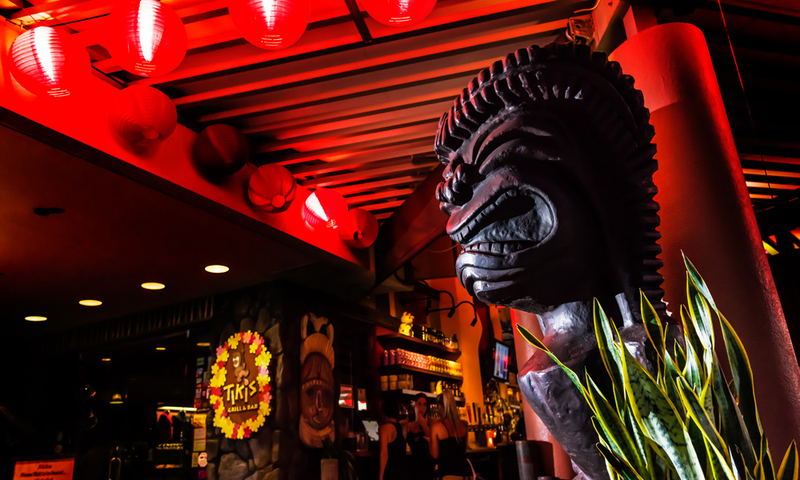 Adam Lapenita, food and drink staff writer for the blogsite Thrillist, wrote in a review that tiki bars are all about three things: exotic drinks, delicious food, and warm hospitality. Tiki’s, the quiessential Waikiki stereotype of what a tourist expects a tiki bar should serve up and look like, met all these requirements, and more. Chris, one of our writers, and I were seated at the far wall of the restaurant (and Tiki’s IS a restaurant, with its vast oasis of tables and chairs taking up the second floor of the Aston, and while by no means intimate and snug like the much more smaller bars I’ve visited, tiki-themed or not, its atmosphere is quite laid-back). There IS a bar in Tiki’s, and I could see it a distance away from where we sat. No matter: the decor was decidedly (and stereotypically) Polynesian, in that 1950’s-style middle-class American vision of the exotic Pacific: bamboo-framed scenes of tropical shores hung off moss rock walls; gaudy tiki statues representing no god in particular, backlit by lamps emanating shades of deep orange and thick red, conjuring a facsimile of lava; large netted glass fishing floaters; glossed wooden tables matched to plantation-style padded wooden chairs, and I think I spotted some rattan ones as well near the bar (hey, isn’t rattan Asian? ); and ginormous sheets of lauhala that subtituted as a false ceiling. The restaurant is ringed with gas-lit torches on the corner of Kalakaua and Paoakalani Ave’s for everyone NOT to notice. To Tiki’s credit, the place is not overly-immersed in the tiki bar kitch. Looking round, I was relieved nobody had been served a drink out of a coconut (I found out later that they do, using a facsimile of one). In fact, I don’t recall seeing anything alluding to a coconut. Instead, Chris and I were rewarded with a line of coconut trees growing along Kalakaua Ave in our line of sight toward Waikiki Beach, as the restaurant squarely faces the south shore of O’ahu. There was no live music the night we went (perhaps the musicians were off that nite). Both our server and the general manager were NOT bedecked in plastic lei, nor were they wearing any Hawaiian print clothing ala Magnum, P.I. – thank God for that, and I say this as a local. Our server did speak to me a bit in Hawaiian, once he found out I was studying the language (he had taken classes through the UH system and spoke better olelo Hawai’i than me). The manager was also a product of UH, and had even played volleyball for the school (yes, THAT Sarah Mendoza – 2014, remember?) They spent minutes talking with us when they clearly should have been attending to other patrons, but I will hazard that, we being all from the UH ohana, they were happy to give us more than the time of day. The food’s good. The drinks are good. The place is reasonable and inexpensive for the average struggling community college student putting in 19 hours a week at an on-campus job (or a tired professor putting in 60). The employees are solid. The decor isn’t overkill. The dining area has space to stretch out without bumping into the next table over. I say, go for it. It’s a place for us locals to play tourist in our own backyard.